The Bulgarian National English Spelling Bee is organized by the Corpus Foundation for Education and Development in partnership with the America for Bulgaria Foundation. The contestants spell, ie. Pronounce, different words letter-by-letter. The words for competitions are selected from a pre-announced list of 500 words. If a contestant spells the word correctly, it goes to the next round. If the spell is incorrect, the contestant fails. Spelling is an elimination competition and the last remaining contestant is declared the winner. On February 28, 2019, the school circle took place at "Ivan Vazov" Secondary school, Sopot. Thirty pupils from the 5th, 6th and 7th grades took part. By the end, they reached a sixth grade and a seventh grader. The winner of the competition is Kristian Todorov Todorov from 7th grade, followed by Nia Nikolaeva Novakova from the 6th grade. 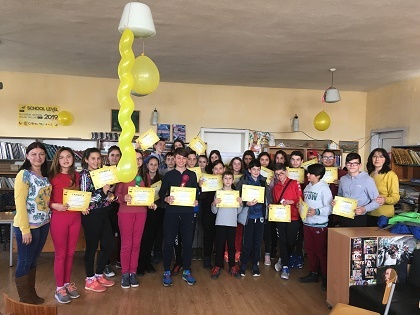 The Spelling Bee 2019 first and second place students will participate in the regional competition on March 23, 2019 in the city of Plovdiv. We wish them a successful presentation. Congratulations to all participants. 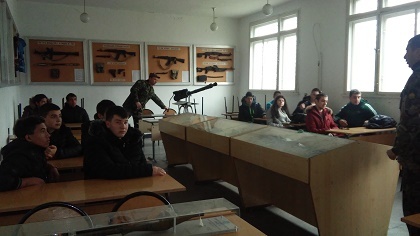 In pursuance of the Joint Action Plan between 61st Strjama Mechanized Brigade and "Friends of the Army" club at "Ivan Vazov" Secondary school, on 26th February 2019 in the town of Karlovo was held the subject of "Understanding the types of weapons and ways of safe handling with them". The students were instructed on the safety measures when handling weapons. They met a Kalashnikov machine, a Makarov pistol and a machine gun and showed the skills of disassembling and assembling a machine gun and a pistol. At the "Ivan Vazov" Secondary school, Sopot, on the last Wednesday of February was celebrated the International Day for Combating Bullying at School. All classes prepared thematic posters for classrooms. 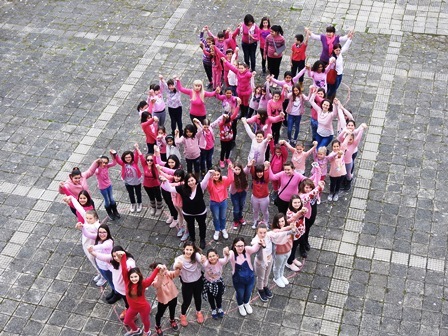 The so-called Day of the Pink T-shirt students and teachers followed the dress-rose, as a sign of mutual support and commitment to the campaign. The initiatives went under the slogan "Every minute you're angry with, you lose 60 seconds of happiness!". Seventh-grade volunteers prepared and gave pink messages to their classmates. At the beginning, they learned the story of the boys from Canada from a presentation. In the long break, they organized a flashbob in the form of hearts. Students from the 6th grade gave their positive messages in English at https://www.facebook.com/SU-Ivan-Vazov-Sopot. Let's Stop Violence, But Not for a Day!